South Africa's Justice Minister Jeff Radebe has called for an explanation from the National Prosecuting Authority (NPA) on why 270 striking Lonmin miners were charged with the murder of their colleagues in what has become known as the "Marikana massacre". This is the question on the mind of many South Africans. "There is no doubt that the NPA's decision has induced a sense of shock, panic and confusion within the members of the community and the general South African public," he said in a media statement. But I think this is merely a facade to create the impression that the NPA's decision has been made independently and the government did not play a role. There are indications that the government has been meddling with the NPA's decision to prosecute some high profile cases, for example its decision to drop corruption charges against President Jacob Zuma in 2009. The courts ruled that the decision should be reviewed. The decision to prosecute Lonmin miners may also lend itself to the suspicion that the NPA is tainted by political influence. In the eyes of ordinary South Africans, the government is trying to appease foreign investors at the expense of aggrieved Lonmin miners who are suffering further victimisation. At the same time, the government is trying to create the impression that it empathises with the people. The miners were charged under the "doctrine of common purpose". Many commentators have already pointed out the absurdity of this charge, focusing particularly on the decision to apply a law commonly used during apartheid. This highlights two major issues. Firstly, will the state be able to demonstrate beyond reasonable doubt, as required by the criminal law in South Africa, that the miners had intended to kill their fellow miners during that fateful day? While the police are clearly on the defensive regarding the role they played during the Lonmin shootings, the NPA's decision to pursue charges against the striking miners raises serious questions as to whether the NPA is being executive-minded in this matter. The burden of proving criminal liability for murder is very high under South African law. Secondly, what does this latest development mean for those miners still on strike? 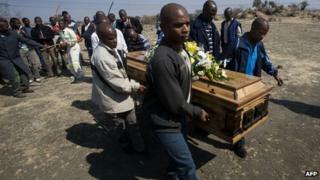 The murder charges will render it even more difficult to resolve the ongoing stalemate at the mine. In light of the Lonmin disaster, the state has been criticised as aloof and insensitive to the plight of the miners in Marikana and elsewhere. Business relationships between some of the African National Congress (ANC) elites and the mining companies have also been questioned. Julius Malema, the former president of the ANC Youth League, continues to make a compelling case that this relationship compromises the state's ability to mediate in labour conflicts. By pursuing murder charges, the state is seen as choosing business over its people. This entire situation plays into the hands of President Jacob Zuma's critics who believe that his leadership style has become a liability for the ANC and has to be replaced. Anyone within the ANC who has intentions to challenge Mr Zuma as the party's president could also use this as a stepping stone to indicate the declining confidence in his leadership, and his ability to deal with crises. Regarding the Marikana case, the prosecution would have to demonstrate before court that the miners, now murder suspects, had a clear intention to have their fellow colleagues murdered. Crucially, this can only be done by proving a causal link between the conducts of the miners and the police decision to open fire. In other words, by charging towards the police, did the miners clearly foresee the possibility of officers shooting and killing 34 miners? Personally, I do not believe they were able to do so. This is where I think the state's case would fail irrespective of common purpose. According to the doctrine of common purpose, had all the miners had an opportune moment to materially commit the crime, they would have done so because they actually had a common intention to do so. While this law lessens the burden on the state to prove criminal liability on each and every individual separately, it does not lessen the burden to prove connection between the actions of individuals and the resultant crime. The miners cannot be said to be liable for the decision by the police to shoot and kill 34 miners. The murder charges will not stick, and far lesser charges will have to be considered. There are currently at least two other investigations into the Marikana shootings, including a probe by the Independent Police Investigative Directorate. So how would the decision to pursue murder charges against the miners impact upon the impending investigations into the role of the police in the killing of 34 miners? By pursuing murder charges against the miners, the state aims to neutralise the investigations into the incident, and intimidate miners to keep them from testifying. This effectively builds a siege environment, under which it will be difficult to attain sufficient testimonies by the miners to ascertain the nature of the conduct of the police in the Lonmin shooting.